Todd's side of the family has been dipping chocolates every winter since 1959. It is a pretty involved process which requires many people to complete the job in a reasonable time. On the days prior to actually dipping the chocolate, different family members make caramel and a variety of fondant flavors. On dipping day we start early, between 7:30am and 8:00 am. The fist step is grinding 10lb chocolate bricks into flakes, which are then melted in a double boiler. In the mean time another group is rolling the fondant into small balls to be used for the candy the centers. Once a batch of chocolate is ready the dipping begins. 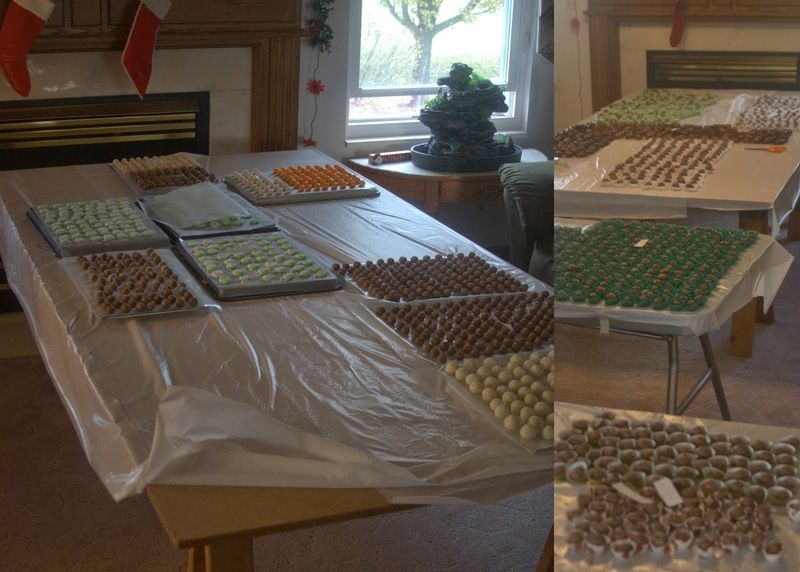 To ensure the dipped chocolates harden quickly, we keep the room temperature low.This year we've had a really mild November so we just couldn't get the house cool enough. Eventually we moved our work to a draft area between a window and the front door which helped a lot. In addition to fondant, we also make nut cups, turtles (caramel and nut) and chocolate dipped caramel. 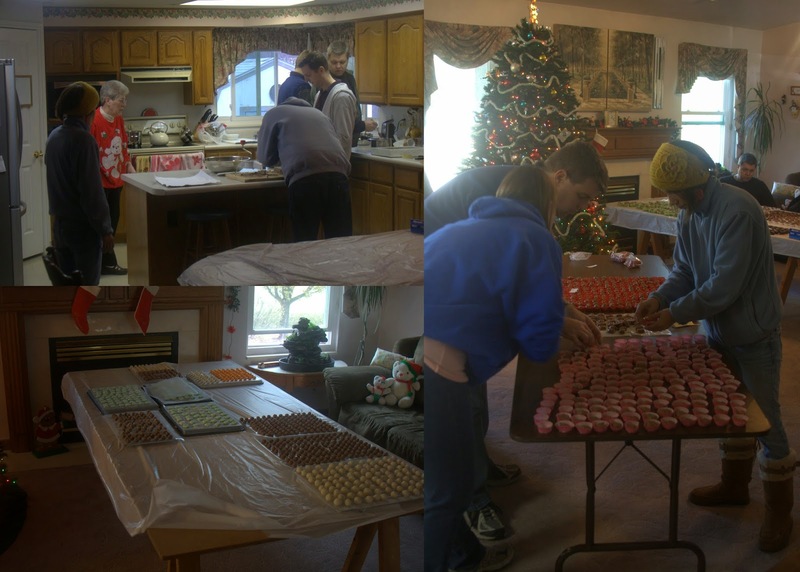 All in all we make over 1,700 chocolate each year that we divide among five -six families. After the chocolates have been dipped we used small paper cups, picture small cupcake wrappers, of different colors to distinguish them. Each tin of chocolates has a legend indicating which flavor corresponds to which wrapper. We usually break for lunch after all the chocolates have been dipped and finish putting them in wrappers, counting and dividing them up after lunch. This year we got home after 3pm. It's quite a bit of work but if you love chocolate, totally worth it!